A big thank you to you for giving such great feedback on the new “bite-sized” format. We received a ton of positive comments on both the new format as well as the addition of Melissa, so we are at it again this week. In this episode, you’ll hear a story from Nancy, who lost her husband a year and a half ago after 42 years together. You won’t believe how she communicates with him – it’s incredible. Her visit to a medium validated many things for her, not only that she can still communicate with her husband but that she’ll join him again one day in their special place. Melissa and I chime in on her story, especially on the wonderful tools Nancy used to comfort herself in her time of grief. We also talk a little bit about mediums in relation to Nancy’s story. My thanks to Nancy for having the courage to go to a medium and get a reading. I was a Christian and understand how that could be an issue. Even though, I am not in a specific religion now because of my experiences, it was interesting to me but perfectly ok, how ‘spirit’ validated its presence with the mansion description and ring/symbol. Thanks for a ‘more frequent’ broadcast! Very sorry for your loss. That’s really difficult. I don’t know who the medium is and it doesn’t really matter. What Nancy liked and what ten other people will like will always be different in the same way we all like different books, movies, and music. But if you’re paying by the minute, that might be your problem. Pay by the mininute readings are usually only 10 or 15 minutes long. I would recommend you schedule a one hour reading with a medium rather than pay by the minute if that hasn’t worked for you. Sometimes it takes ten minutes before the medium really gets going, and I’m talking about great mediums here too. If you preschedule a one-hour reading with a medium, you’ll get a whole hour of evidence and messages often. 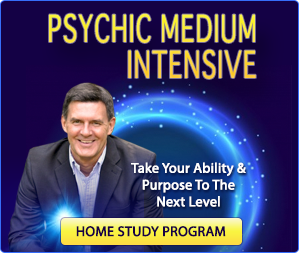 EQUALLY as important, if you’re seeking direction in your life, you might not want a medium. Mediums communicate with spirits. You might want a psychic. 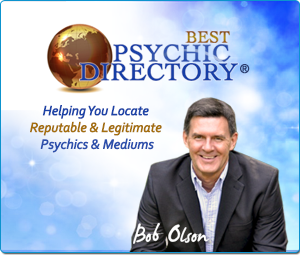 Psychics are better with helping with direction. But never just listen to what a psychic tells you. Instead, listen for what they tell you that confirms what your own inner wisdom is telling you. Never do anything unless if feels right to you. Perhaps a good financial advisor might be a better use of your money. 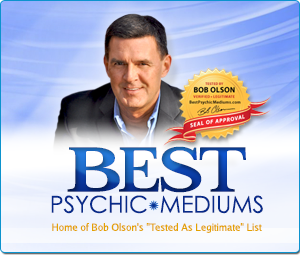 Check out my two sites to make your choice of the right medium for you. Trust your intuition, not your intellect. There’s a video on the Home page of my directory that teaches you how to choose wisely. 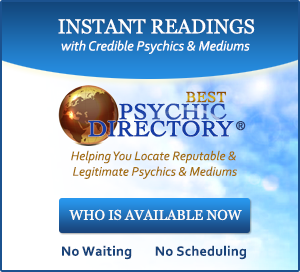 Otherwise, the two sites are http://www.BestPsychicDirectory.com (you can choose by location, specialty & read reviews) and http://www.BestPsychicMediums.com (where I write about some readings I’ve had). I hope all this is helpful. love the bite sized segments! 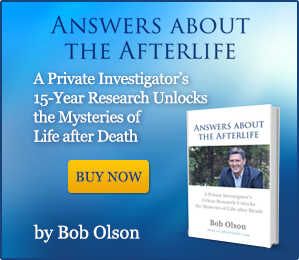 after losing my husband and my youngest son, I have had many signs and experiences from them in the afterlife. one day soon, I will share some of them with you and your audience. 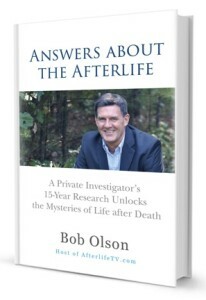 thanks bob and melissa for this great format and the experiences that you are presenting in evidence of the afterlife. I have been able to see spirit since about 10 years old so I know it exists. thanks again and will keep listening! Thank you! I look forward to your stories. And I appreciate your wonderful feedback. Hi Bob, thank you so much for the wonderful work you are doing and the stories you bring us. They are so uplifting and hopeful. I could hear the sadness in Nancy’s voice as she spoke. In two weeks it will be five years since my beloved husband passed and I still miss him every single day, yet continue to receive messages from him very often and beautiful loving dreams. It all helps to reassure me he will always be with me. Yes, I heard the shaky voice, too. Dealing with the death of a loved one is such a difficult experience. I’m sorry to hear about your husband’s passing. However, I am happy that he’s still sending you signs and visiting you in your dreams. How nice. Thank you for your comment. Wonderful message about connecting with her husband on the other side. Love the short broadcasts. To know where you are going after this life is comforting. I read a story once about a husband who had passed and he was finishing the home over there by laying white rose pedals all over the floor and had them imbedded in the floor- as that was his wife’s favorite flower. Keep the love flowing and I hope more will listen to your show. That’s quite a story, and a visual–I can see the rose pedals in the floor. What a lovely idea. Thank you for your thoughtful comment. Glad you like the bite-sized episodes. Me, too. New format WITH Melissa is great. Love her photos. Felt compassion for Nancy. After 37 years together, have been worrying about the future, as we have no children & my husband is my best friend. Sadly, an experience all loving couples will face. Her story offered comfort as does your work. Ordering your new book May 3rd!!! I know how you feel. Thanks for your kindness and support. Hope you like the new book. Happy to hear downing has been good for you. That’s pretty amazing. I appreciate you telling me about that. Thanks for your story Nancy! It gives me a lot of comfort to hear the stories. I lost my son at age 43 to colon cancer. Ive had signs but not in the past year. It has been 3 years since he left. I miss still so much. I know he is ok but I would love some more signs. These stories give me hope! Sorry about your son’s passing. I hope you get more signs soon.